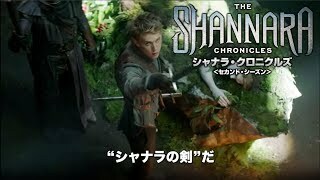 シャナラ・クロニクルズ ＜セカンド・シーズン＞ THE SHANNARA CHRONICLES SECOND SEASON 2017年 ©2017 Viacom International Inc. and Sonar Entertainment Distribution, LLC. All Rights Reserved. The Shannara Chronicles and all related titles, logos and characters are trademarks of Viacom International Inc. Spike is a trademark of Spike Cable Networks Inc.